Dr Musella's organization ( the Musella Brain Tumor Research Foundation ) is superb and his own upbeat remark is among the back-cover praises for the EMPOWER Yourself to Cope with a Medical Challenge book. Want to cope with medical and/or mental health problems, including the expenses for your care? 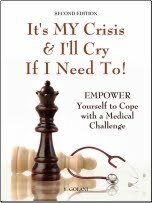 Buy the E-book or print edition of EMPOWER Yourself to Cope with a Medical Challenge . November 26, 2018 at 3:43 AM The Power of Having Fun, Clinical Trial Information, Traumatic Brain Injury (TBI) Help and MORE! October 30, 2018 at 3:44 AM Digital Devices Endanger Children! October 25, 2018 at 9:43 AM The Answer is "YES!"